During a recent VO staff meeting a topic of conversation was what bike we would choose if we could only have one. 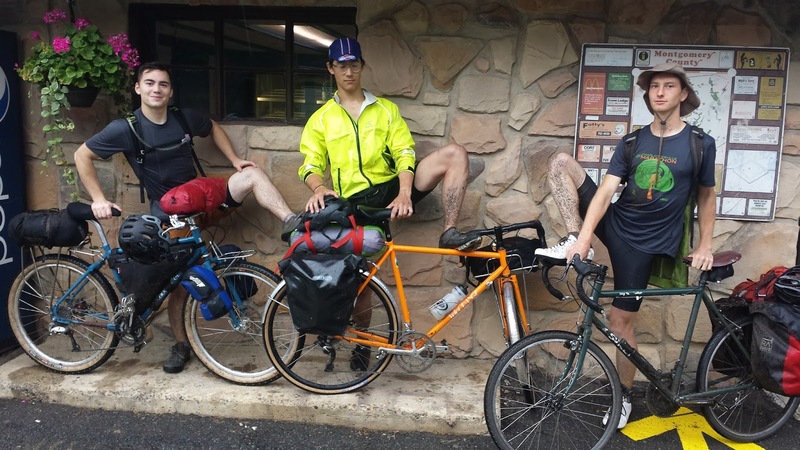 I've recently been thinking and reading about the idea of simple living so this really interested me, so much so that I asked our staff to write a few sentences about what they would choose if limited to one bike. Adrian: Well that's a commitment and a half! If I could only choose one...I'd have to be my 26" Campeur. As a 5'5" lady, I've become quite enamored with that wheel-size; it suits me well. Aesthetically, I like the classic styling of the Campeur. It's a solid daily driver for my commute to work, that handles well when full-loaded for weekend touring. It's all the bike I want and need. Scott: I'd go with a Piolet. I got to test one out last year, and it is my mid-life crisis bike. It takes me back to when I was in my early 20's, riding all over the place, on and off-road in BC. This is the bike that I can see taking back to Iceland and doing gravel road tours with my wife for years to come. I can run it with wide touring tires for the rough roads of Iceland and also put 2.4 MTB tires on it so I can ride the single track near our home in MD. It's the do anything bike that I dreamed of and now it's a reality. Clint: I'd go with the new orange Bike-That-Must-Not-Be-Named. As much as I love the trails, I spend more time on the bike as a means of transportation. 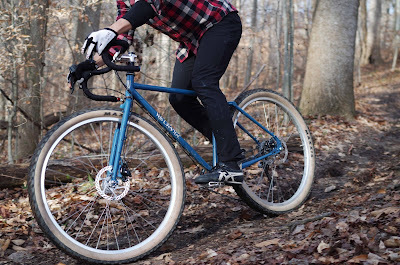 But that's not to say I couldn't put some knobby 32s on You-Know-What and hit up some singletrack. The Orange Lord was great loaded on the C&O, great for groceries, and this Friday I'm riding up to Baltimore for Bike Party! Mark: The Pass Hunter would be my choice. It suites the style of riding I actually do: fast road rides. Plus it's red and it's proven that red bikes are faster. Brandon: I would choose the Piolet. It is the bike in our line-up that is most capable off-road. It is the frame that I can most easily customize. It has a ton of braze-ons and fittings so I can run it with all sorts of racks and parts on it. Plus it has disc brakes and the teal color looks fantastic. Igor: Campeur, hands down. In four years it has taken me everywhere I've wanted to go and plastered a smile on my face for every mile. Loaded or stripped down it has neutral and confident handling. The frame fits tires wide enough to be confident on gravel, flowy singletrack, and poorly maintained country roads. The metallic grey with a tinge of purple gives it understated and timeless styling. But honestly, it just feels so good passing roadies on carbon fiber wonderbikes with a bike that has racks, fenders, and downtube shifters. Annette: Oh, you people are so fickle, with your heads turned by the latest pretty thing. Have you all forgotten that the oldest bike in our fleet, the Polyvalent, means "multipurpose," and by design is "the one"? Alec: I like to ride fast and to not slow down no matter the road surface, or lack of same. So it has to be my Red Pass Hunter. Chris: A few years ago I would have chosen a Pass Hunter, and this is still the bike I ride most often. But as I've grown older I've been drawn to larger tires and to unpaved roads, so I'd choose the Camargue. It's a bike that's nice enough on a paved road, but really shines on gravel farm roads and double-track. It also makes a great city bike, especially if you live in a town with old brick and cobblestone streets, like Annapolis, or if you like hopping curbs. What about you? What would you ride if you were limited to a single mount? And do you really need more than one bike? There's not much going on at VO HQ this week so I figured I'd write about my weekend trip with the new Piolet and this other orange frame I can't talk about. 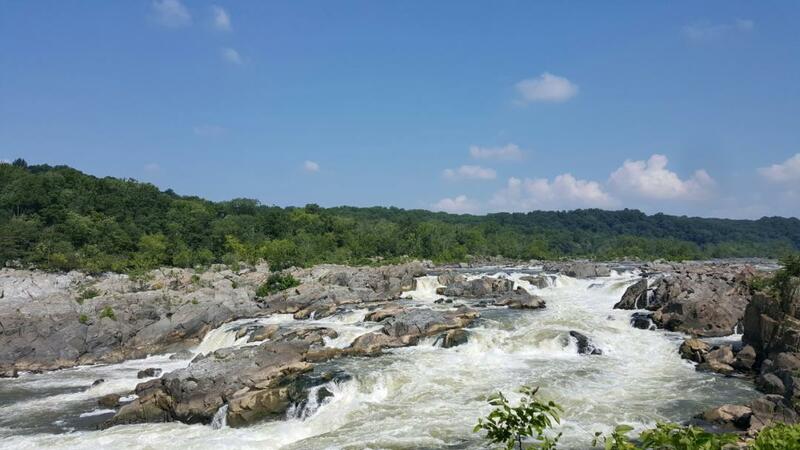 Met up with a couple buddies and we biked out to Harpers Ferry via C&O trail. 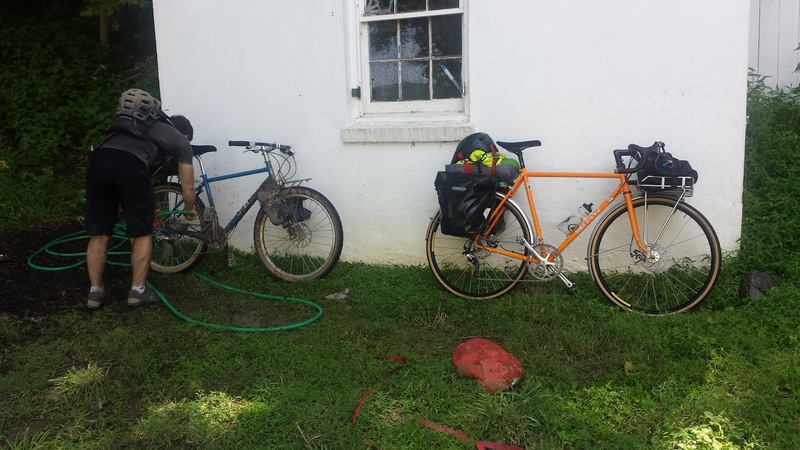 The campsites were buggy and the trails were muddy, but we still had a pretty good time. The temperatures were in the 90s with high humidity all weekend which meant no sleeping bags at night and a lot of shirtless dudes. Weekend Thighlights. For the ladies. We set out Friday night and got to the campsite around midnight. In the morning, we had coffee at the campsite with one of my coworkers who was also out on the trail that weekend with a friend. Had to pack up camp pretty quickly with the oncoming storms. We rode through the rain all morning. From that point on, everything was covered in mud. Quick swim to cool down and clean up. 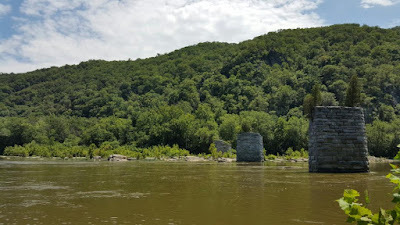 We jumped in the water by Harpers Ferry; we needed to clean up before going into town for lunch. Didn't stay for very long. 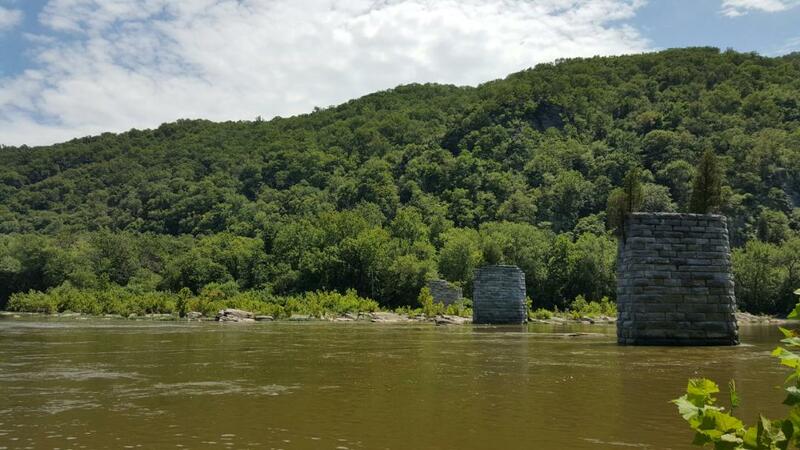 Harpers Ferry was great and all, but we wanted to make our way back to the campsite. The next day we rode straight back. 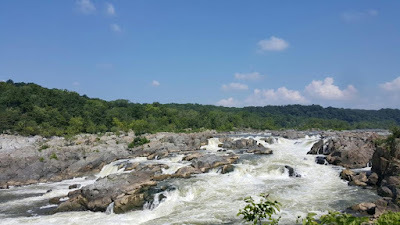 Made a quick stop at Great Falls to see what we had missed on the first night out. Made it back in time to crash on the couch and watch bad Sunday afternoon TV. Both new frames were perfect for the conditions this weekend. The disc brakes were fantastic for the rain and mud. Andrew, who is primarily a mountain biker, was on the Piolet. He described it afterwards as "a valiant steed shepherding you through grand adventures." 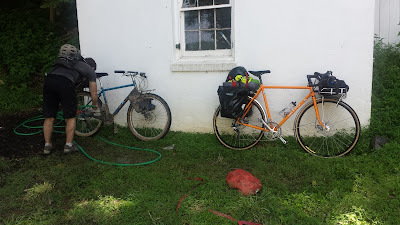 I was on the orange bike for the weekend. It was stable enough to handle the load and nimble enough to navigate the city at the start and end of the ride. Plus the porteur bag up front was filled with snacks! Keep an eye out for more on the new orange bike. The VO Grand Cruz is cruising toward the 43rd RAGBRAI tour of Iowa. They'll be stopping in Denver and Omaha to show off our products. Check out the official Grand Cruz blog for details. Lot's of folks have have asked for high quality 27" rims. I wasn't really sure if there was enough demand, but you kept asking. So we ordered a production run of our very popular PBP rim in 27" size. The Dajia Shallow Drop bar is now available in 46cm width. Another shipment of Rustines products has arrived from France. Patch kits, #1 and #2 size, are back in stock. as are some of the rubber bar plugs, grips, and white colored bungy cords. We should get a second shipment in a few weeks with the other items we're out of. Rustines products, especially patch kits are selling faster than we predicted. With the lead times and the factory being closed for vacation during August, we probably won't catch up on stocking until fall. Are clipless pedals really more efficient then flat pedals? Maybe not. Watch the video. The Piolet, our new adventure touring frame, is here. It's designed for off-pavement touring, including dirt and gravel roads, dual track, single track or no track at all. We built it to be sturdy, simple, and very capable. Note the bosses for racks and fenders. As with our other frames, it's built from double butted chrome-moly, including the fork. The seat stays are a cool mono-stay design. The fork is also our own segmented design and loaded with bosses for mounting racks, water-bottles, gear cages, and even fenders. Both the frame and fork were tested to meet MTB standards. The non-suspension corrected fork looks great. The Piolet frame is not suspension fork corrected. This really improves the appearance and helps us optimize handling. It uses disc brakes. You can go with hydraulic brakes, but we prefer the simplicity of mechanical (cable) actuation. The small and extra-small sizes use 26" wheels (easier to find than 650b in remote locations). The larger size frames all use 700c, or 29er, wheels. The Piolet is designed for 2.4" tires, but larger tires will fit. You can also use 650b (27.5") wheels on the larger size frames (M, L, XL). We find that 650b x 2.8" wide tires have almost the same diameter as 700c x 2.4", so handling will be as intended and there is sufficient tire clearance. Again, note all the eyelets and bosses. There are mounts for five water bottle cages. Two of these are on the fork. The Piolet has full mounts for front and rear racks. 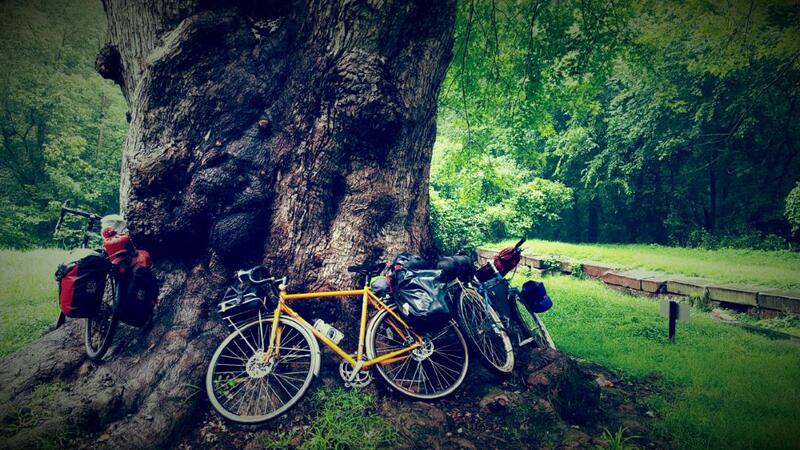 You can set it up like a traditional touring bike or bike packer style. 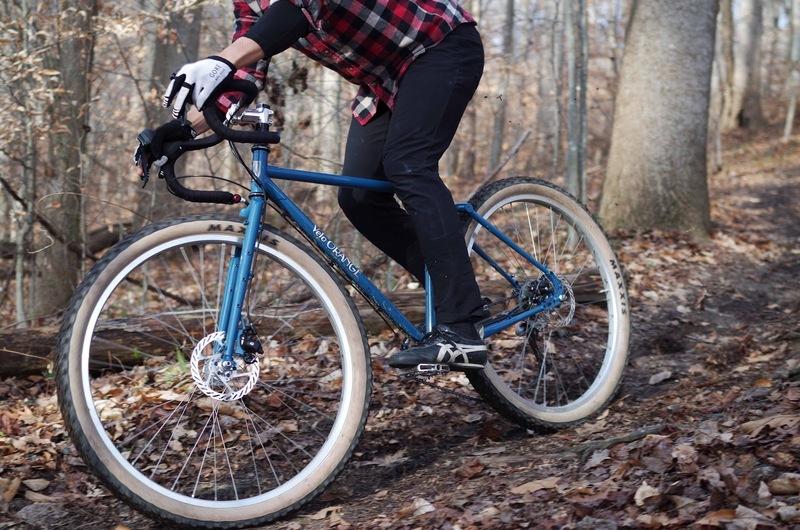 The mid-trail geometry allows for front or rear loading. Fender boss and front derailleur cable stop. There are proper fender mounts; this is a VO frame after all. We've designed the Piolet to work equally well with drop bars and with flat bars. Here's the technical stuff you or your mechanic will need to know when building it up. 135mm rear spacing with vertical dropouts. IS mount disc brakes, cable or hydraulic actuation. 27.2mm seat post. Bottom pull and bottom swing front derailleur. 73mm standard British, or ISO threaded bottom bracket. 1-1/8 inch headset. The geometry chart can be found here. 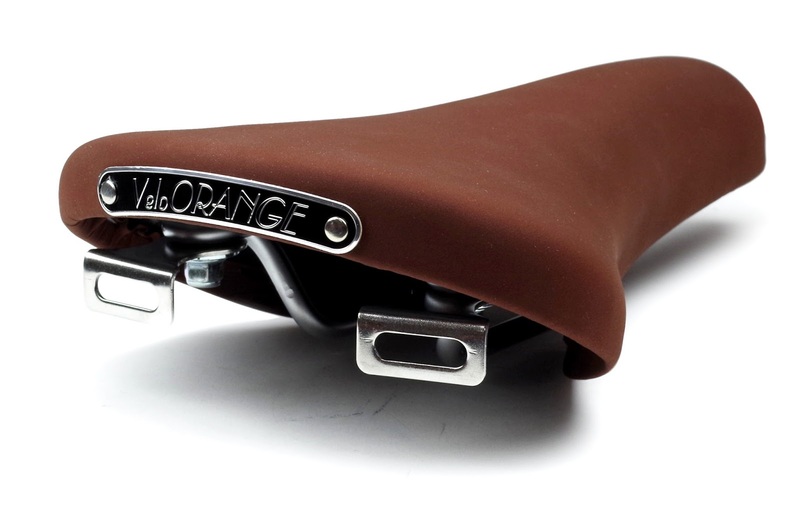 Our original VO microfiber touring saddle has been very popular. That's not surprising since it's much lighter and less expensive than a leather saddle, yet still very comfortable. With its suede-like top it also retains the look of a classic saddle. We've now added a wider version, designed for folks who keep their handlebars at or above saddle height, or who simply find a wider saddle more comfortable. At 165mm wide it's about the same width as a VO Model 3 or Brooks B17 leather saddle. But that's somewhat deceptive because there are no rivets or a flaring leather "skirt." So the sitting area is comparable to a slightly wider leather model. At 425gm the weight is significantly less than that of a modern leather saddle. Length is 282mm, about the same as a Model 3. There are loops for a saddle bag, which so many of you asked for, and a proper metal nameplate. These microfiber top's texture keeps you from sliding around and it's weather resistant. The body is thermo-plastic with a layer of high density foam. The rails are chromoly. By the way, no microfibers were hurt in the manufacture of these saddles--all materials are vegan approved. The photo above shows the original and the wide versions side-by-side. Velo Orange will be closed Friday, July 3, for the Independence Day weekend and general revelry. Those of you in the Bend (OR), Boise (ID), and Salt Lake City (UT) areas can catch the VO Grand Cruz rolling through from July 5 - July 9 on its way to RAGBRAI in Iowa July 19 - 25. And everyone from the west coast to Iowa should check the Cruz blog for weekly schedule updates and reports.